Science magazine writer Balter gives a tour of the physical and symbolic remains of prehistoric Çatalhöyük, a 9,500-year-old town on the Anatolian plains. In 1958, British archaeologist James Mellaart began poking about on a tell in south-central Turkey, searching for evidence about the spread of the Neolithic Revolution. What he found was one of those archaeological wonders that boggles the mind and sets archaeological theory on its ear: an enormous town sitting on the very cusp of the Neolithic in terms of art, architecture, religion, and family structure. Filled with critical examples of how people lived and expressed themselves at a pivotal moment in human development, Çatalhöyük would prove to be a testing ground for archaeological practice. Ian Hodder, who oversaw the site after Mellaart was asked to leave when an important artifact disappeared, shared some controversial notions with his predecessor. Both believed artifacts could help them make cultural interpretations of the symbolic world of ancient people; they went beyond strictly adaptive and functional readings of materials. Balter, the excavation’s official biographer, is a fine storyteller and reporter. He gives a succinct history of the various schools of archaeology (and various tendencies within the schools), making the case for ideology, religion, and psychology as bases for interpretation as opposed to only technology, economy, and demographics. 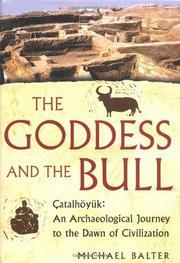 While the author is no sensationalist, it’s impossible not to feel a shiver when he describes Çatalhöyük’s trove of artwork: the obsidian mirrors, the wall paintings of leopards, bulls, vultures, and goddesses (the last suggesting a matriarchal society). Many questions about Çatalhöyük remain unanswered. Why did the community build its town on a malarial marsh? What external forces constrained them? What environmental riches did they tap? A canny narrative history of a wondrous archaeological site, full of personality and personalities, and ripe with thoughtful conjectures.